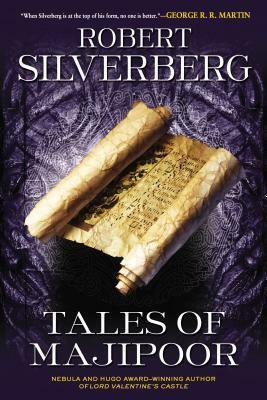 Tales of Majipoor by Robert Silverberg is a somewhat uneven collection of seven stories that are set in his world ‘Majipoor.’ They are set in different time periods, some at the beginning of colonization, and others set during key events in Majipoor’s history. Others are more intimate stories, and there’s even one featuring Lord Valentine. In this review, I’ll discuss the first three stories, and leave the rest for the readers to discover on their own. If you haven’t read any other books set in this world, there are some details that will escape you, and even some parts of the stories that may be a little frustrating. That being said, for the most part these stories stand fairly well on their own, and are a nice cross-section of different time periods and people in Majipoor. There’s a prologue that gives new readers a brief background of Majipoor, the colonization that took place despite the presence of natives, the fact that other alien species eventually settled on Majipoor, and other details. The use of magic and technology didn’t always seem well-explained for newcomers, and it might be confusing without additional background. In fact, it seemed that at times, science fiction and fantasy were being juggled, and no balance between the two was adequately reached in any of the stories. End of the Line Gives readers insight into how Lord Stiamot (this is where having background in the Majipoor series is helpful) became Coronal. While he has different problems in this story, he’s ultimately likeable, and by setting this as the first story, it makes later references to him as an important figure in history more interesting, because the audience has seen him before myth turned him into a symbol. The Tomb of Pontifex Dvorn continues the theme of history. An archaeologist receives an enticing offer: being able to excavate the tomb of Dvorn, the first Pontifex, AKA, the ruler of Majipoor. While this story again lets readers gain insight into different historical events, the literary style makes it seem like something being related to an audience, and therefore isn’t easy to empathize with characters because they almost seem like characters on a stage. This is common in several other stories, as is the abrupt inclusion of religion, magic, and the sparing use of technology, although in such a large timespan as the one covered in these stories, it seems that it would have made a much earlier appearance. Ultimately, it’s the emotional distance and uneven portrayal of the above elements that makes this collection uneven, and new readers would be advised to start with an earlier installment in the series.